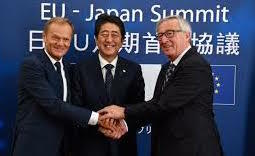 On July 6th, the European Union and Japan reached an agreement in principle on the results, to date, of the negotiations of the Japan-EU Economic Partnership Agreement (JEEPA). One of the areas in which the two sides announced results is government procurement. This post examines those results, in particular, in comparison to the current obligations of the EU and Japan under the WTO Government Procurement Agreement (GPA). It also briefly reviews the next steps in the negotiations. Under JEEPA, the two GPA parties will expand their respective market access commitments in three areas: sub-central entities, other entities and the railway sector. They also agreed to add new disciplines to the procedural rules in the GPA. According to the agreement in principle, the most important new market access under JEEPA is Japan’s offer to cover the procurement of its 48 “core cities”, cities with a population of around 300,000 inhabitants. They represent roughly 15% of Japan’s population. Japan’s coverage of cities under the GPA is limited to its 19 designated cities, cities with a population over 500,000. The core cities will open their procurement under a non-discrimination regime, which suggests that they would only be obligated to treat EU goods and services the same as Japanese goods and services, and would not be required to follow any procedural disciplines. This would be similar to the EU’s GPA coverage of its works concessions contracts under a national treatment regime. Although the agreement summary indicates that the EU “agreed to reciprocate by like commitment” at the sub-central level, it is unclear what new access Japan will gain. The EU already has broad sub-central entity coverage under the GPA and only limits Japan’s access with respect to domestic review procedures for one category of EU sub-central entities. Japanese firms may not contest the award of contracts by EU contracting authorities that are bodies governed by public law, until the EU accepts that Japan has completed coverage of its sub-central entities. Other entities that the EU and Japan have agreed to open under the bilateral accord include hospitals and academic institutions. An EU fact sheet notes that Japan will open up the procurement of 87 hospitals and academic institutions and 29 entities engaged in electricity distribution. The EU has not indicated the entities that it will open under this provision. Obtaining greater access to the Japanese market in railway equipment and infrastructure was one of the EU’s priorities in the negotiations. It has, at least, partially accomplished this aim with Japan’s commitment to withdraw the “operational safety clause” related to railways that it applies under the GPA. Using this clause, Japan effectively precludes foreign suppliers from participating in procurement of trains and other railway equipment. Under JEEPA, Japan will open safety-relevant railways procurement above a value of 400,000 Special Drawing Rights (SDRs). This is twice the 200,000 SDRs threshold that both Japan and the EU apply under the GPA to procurement of goods and services by their railway entities. Japan will have a one-year transition period after entry into force of the Agreement before it opens this procurement. The EU will reciprocate by partially opening its railways procurement for overland railways, and rolling stock for urban railways in “an amount corresponding to the estimated value of Japanese contracts ‘freed’ by the removal of the operational safety clause”. This EU opening includes equipment for public transport in towns and cities, such as trains and signalling for metro systems. Under the GPA, the EU denies Japan access to its railway sector, specifically procurement by entities operating in the fields of urban railway and railways. With respect to procurement rules, the Agreement’s procurement chapter will build on the GPA, with the addition of several new disciplines. Those include rules regarding the electronic publication of notices through a single point of access. This would likely extend beyond the GPA’s requirement of a single point of access for central government entities and encouragement of such access points for sub-central and other entities. Another new discipline requires “the fair treatment of EU construction businesses under the Japanese construction business evaluation system (keishin)”. This provision is presumably aimed at long-standing challenges faced by foreign firms in trying to participate in Japan’s construction sector. Another area in which the new rules go beyond those in the GPA relate to domestic review procedures, in particular, JEEPA will add “new standards for the remedies available to bidding companies if they think they have been treated unfairly”. JEEPA is the second agreement in which the EU has successfully persuaded a GPA party to expand its commitments, the first being with Canada. In their bilateral agreement, the EU has gained unprecedented access to Canadian procurement at both the sub-central level and its MASH sector (municipalities, school boards, publicly funded academic, health and social service entities). Japan and the EU hope to finish work on the trade agreement by mid-2018 with an aim of entry into force in early 2019. Further work will be needed to “fine-tune” some chapters and to resolve outstanding issues. Two areas in which the two sides have yet to reach agreement are the resolution of disputes between investors and governments and data protection. With regard to investor dispute settlement, the EU has rejected the use of the investor-state dispute settlement (ISDS) mechanism, which is found in most trade and investment agreements. Instead, it has proposed an Investment Court System (ICS), which it inserted in recent agreements with Canada and Vietnam. To date, Japan has refused to accept the ICS as part of JEEPA. This entry was posted in European Union, Trade Agreements and tagged European Union, FTA, Government Procurement, Investment Court System, Investor-state dispute settlement, Japan, WTO Government Procurement Agreement (GPA) by Jean Heilman Grier. Bookmark the permalink.